Update: a feature article on the DFR was published in the November 2015 QST – check it out! It’s been a while since I have made a blog post, but I have been busy with a number of building projects. The first of these to complete was the DFR – the Digital Fist Recorder. This device is built from an Arduino with software I wrote to record and play back Morse code messages sent with a hand key. The recordings preserve the exact timing of the pulses, and so record the sender’s “fist” or distinctive sending style. The idea for this project was suggested to me by the ham who sold me the Vibroplex bug I described in the previous post. Here’s a photo of the interior, showing the Arduino stack on the left, and the keying circuit, a commercial kit called a KeyAll that uses FETs that can handle high voltage and either polarity keying. There will be more details on this to follow. 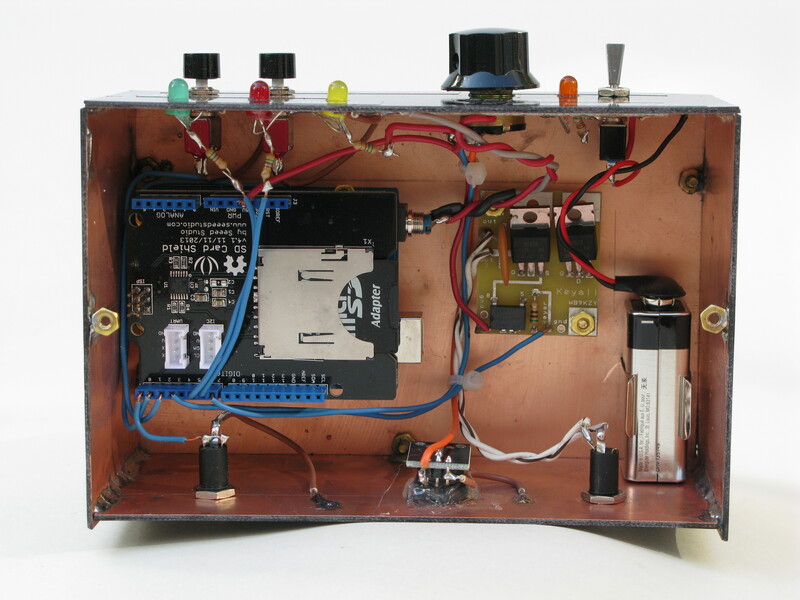 This entry was posted in Arduino, Ham Radio and tagged Amateur radio, Arduino, ham radio, Homebrew, keyer, Morse code. Bookmark the permalink. 3 Responses to The DFR – just briefly.